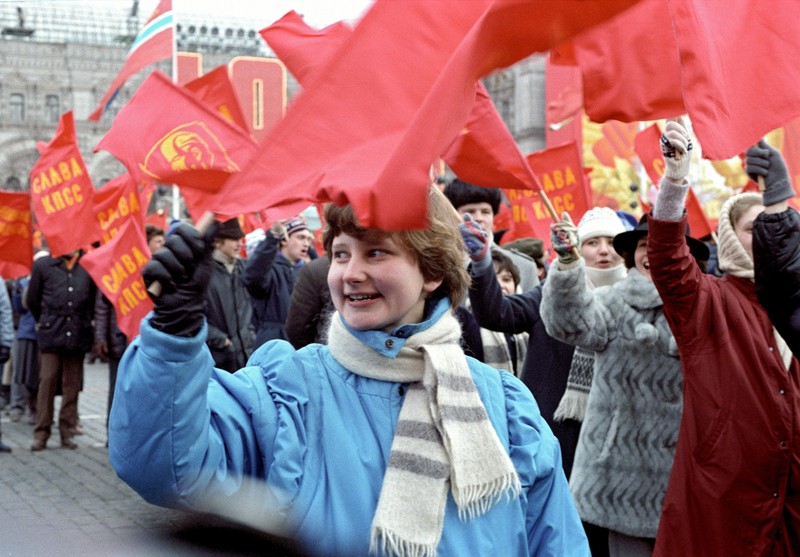 Demonstrators celebrate the 69th anniversary of the October Revolution. On November 4, Russian citizens celebrate National Unity Day. This is a relatively new Russian holiday, which came into being from 2005. In a country where more than 160 languages are spoken, where there are dozens of ethnicities, practicing all the religions of the world, the idea of unity becomes the only essential for peaceful coexistence and national development. The National Unity Day celebration was brought to life for a number of very obvious reasons. The creation of a new, Russian, not Soviet, nation required new symbols. We had to find an event that was in the vicinity of November 7 (the anniversary of the October Revolution in 1917, was the official national day of the Soviet Union from 1918 to 1991 – Ed.) to create a holiday that would come close to the Soviet tradition. National Unity Day, whose historical roots date back to the beginning of the 17th century and the end of Time of Troubles (a period of national and dynastic chaos from 1598 to 1613), when Polish troops were expelled from Russia and new Tsar Mikhail Romanov was elected, became such a holiday. An important holiday and a stately one. But, in my opinion, it is deprived of the necessary emotional contagion, while speculation is not always to the benefit of any state celebrations. I am sure that there is no holiday in Russia today, which can be compared, in its unifying power, with the 9th of May, the USSR's Victory Day in the Great Patriotic War and World War II. This war is still embedded in the hearts of all the citizens of Russia, their fates and human ties. The memory of the war, the pride of victory, for their parents and grandparents, undeniably unites the new Russian and earlier Soviet history. The attitude of modern Russians to the Soviet past is different. At the same time, Russians are significantly freer in their judgments than the Soviet people. We got all the constitutional rights of which they could not dream of in the Soviet Union; the right to freedom of movement, freedom of speech and the right to property. Today's Russia is a capitalist country, where, for all that, the government is trying to maintain a social responsibility to the citizens, which is very difficult in the current economic situation. The role of religion in society has changed. Freedom of conscience, stated in the Russian Constitution, has led to the development of our country's traditional religions; Orthodox Christianity, Islam, Judaism and Buddhism. But it is precisely because of multi-religiosity that none of these faiths could become a state religion. Russia is a secular state. Today, patriotism is quite often – and in my opinion, wrongly – regarded as a kind of national ideology. I believe that such an understanding is incorrect. Patriotism is a normal human feeling, like love of parents, which is usually not related to the political beliefs of a person. Its manifestations are certainly dependent on upbringing. However, it is important for society and individuals to distinguish between patriotism and nationalism. One should not forget that patriotism is inherent in all people. In Russians as well as in Tatars, Bashkirs or Chechens (Russia's second, fourth and sixth largest ethnicities, respectively – Ed.). Certainly, every set of people have their own language, their intangible heritage; customs, traditions, rules of conduct, art and culture. Not everything matches, even if the people belong to the same linguistic group or share a common religion. That is why we must be extremely cautious in such a sensitive area as ethnic relations. Russia is a country where multiculturalism is accompanied with some general civil rules of conduct. I will make no secret of the fact that it is extremely difficult at times to maintain the balance of interests of different peoples living side by side. Russia is a country of changes, which, however, has a high inertia. This is due to its vast spaces and tragic history, which has influenced the formation of the people living in it. It is about this conservatism of Russian life that Andrei Konchalovsky made his recent film, "The Postman's White Nights." Aleksei Balabanov, deceased in May 2013, in all of his films made in the 2000s; "Brother," "Brother 2", "Cargo 200;" researched exactly the fickle nature of Russian man who was tested to the limit by the steep turns of Russian history. Russian filmmakers constantly, from the masters of the older generation to the creative youth, have turned to the theme of "People and War," which has become an integral part of Russian life and Russian culture, for good. The author is a statesman, for Minister of Culture of the Russian Federation (2000-2004), chairman of the Federal Agency for Culture and Cinematography (2004-2008), and currently scholarly director of the Higher School of Cultural Policy and Management in the Humanitarian Sphere at the Moscow State University.